I had a nightmare of a time finding this guy.. he's not right in H-7, but more in the corner, occasionally crossing into I-8. He's kinda hidden, behind the weapons and armor merchants (Jirokichi and Achika), and under where the questgivers Heizo and Heiji are standing. Hopefully this'll be of some help. 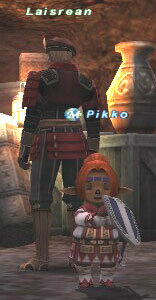 Damn Pikko, u get almost every picture lol, what server are you on?